How my dogs are better parents than me…. Are you a believer that pets are good for kids? We certainly are. We are blessed, or cursed some may say, to have enough space for a whole load of them. To date we have; four horses, six dogs, six cats, three guinea-pigs, two turtles, tank fish, pond fish, chickens, ducks, turkeys and geese. Oh and there are usually a few pigs roaming around too. You’d think that we live on a farm, if only! We do have a fair amount of space though. This mixed with an aversion to the word no, has led us to the menagerie that we have. We really do love our animals. They are part of our core existence and the ethos in which we like to live our life. We genuinely feel that the benefits that we get from them as a family, especially the kids, hugely outweigh any negative factors…such as the HUGE feed bill every month! We see time and time again, the way they help our kids to develop and grow, and they are a constant source of examples to demonstrate certain things to the kids, in a way that they can relate to. Mix this with an endless source of fun, amusement and companionship and we really seem to be onto a winner! One of our over-riding fears when we first ventured into parenthood, was that the kids would grow up hating animals (or be allergic to them!) I am relieved to say that, at this moment in time, it isn’t the case. They love our animals. Antihistimines deal with the rest! Sometimes though, even our friends think we are mad, to have so many animals. But our animals really unite us as a family and serve to draw us closer together. In this series of blogs I want to demonstrate the positive benefits that I see each of our animals bring to the kids and the family as a whole. I am going to start with our dogs. As I say, we have six dogs. Two of these are working police dogs; Vic is a general purpose police dog – he bites and tracks and finds property. Diesel is a drugs dog – he finds drugs and weapons and cash. Alas he has never found us any of the latter. We then have four pet dogs; Locke is a retired police dog. Sophie is a failed police drugs dog – she could find drugs, and cash, but couldn’t find weapons. She was required to do all three. Jack is a pet, just a loveable fluffball. Last, but not least, the youngster Buddy. He’s the rogue of the family. What follows are the things that make me proud that our kids learn from our dogs. The lessons they learn, they can, and do, apply to life because they are able to see, feel and interact with them in such a way that the lessons become part of them. Whether they realise it or not. Physical fitness – as a family, we take the dogs for at least two walks a day. It doesn’t only provide us with exercise, but more importantly, it’s a chance for us and the dogs to let of steam, run around, play and have fun. The kids really look forward to the walks and they’re an integral part of our day. Of course it also means that the kids are out, whatever the weather, and not stuck in front of the TV. Bonding – the time we’re walking the dogs is a real chance for us to bond as a family. It’s a space for us to chat, laugh and catch up on the day we’ve had. The dogs don’t care what we’re chatting about, they just love to be included. Respect – the kids have really started to learn respect for the dogs. They see them as friends, but especially with the police dogs, have seen the power that they have. They have been quick to realise not to take this for granted, but to treat their friends with the respect and courtesy they deserve and, in return, they get unwavering loyalty. A lesson for all of us. Personal space – the kids have a huge awareness for personal space. They seem to know when enough is enough. If the dogs are sleeping, or have put themselves away, you leave them be. They’ve earned their rest. They have seen that if they badger the dogs, they soon lose interest in playing with them. In return, if they’re busy they expect the dogs to leave them be. Fun – there’s nothing quite like playing with the dogs. Their boundless energy and love for life has the kids, and us in turn, in fits of giggles as they leap for the ball, or chase their tail. It teaches them to love life. Good behaviour – the kids see that the dogs don’t get what they want by being pushy, or rude, or aggressive. Instead they see that by behaving well they get praise and to play and have treats. They are starting to realise that this works for them too! Responsibility – the kids argue over who gets to feed the dogs, walk the dogs, groom the dogs, wash the dogs. They seem to appreciate that with the fun, comes the work and the care and they treat this with equal vigour. Loss – at some point, sadly, we will start to lose the dogs. Most of them are getting on now. We have spoken to the kids about this, but nothing can quite prepare you for that huge sense of loss. It does however give us a platform to explore death with the kids and how to manage grief and loss. Something that we can’t avoid in life. 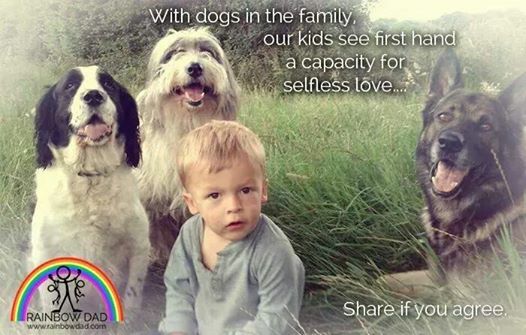 Selfless love – our dogs have the biggest capacity for love. They demonstrate this in their unwavering loyalty to us and the kids, and they ask for little in return. They are always there for a hug and a play. There is little that beats the sight and sound, of our kids using the dogs as a pillow, when they are watching the TV or something, the contented sigh that they both release never fails but to warm my heart. Our dogs never get caught up in the insignificant stuff. They are never too busy, or anxious, or stressed to play or lend an ear. Their time is yours, their love is yours. It is never doubted or hidden with an angry word. The dogs are always happy to see us, they are also very forgiving. Their loyalty really knows no bounds. This is why sometimes I think the dogs are better parents than me. You see, it’s not only the kids that need to learn from the dogs. Sometimes, just sometimes I could do with taking a leaf out of their book….couldn’t we all. ← Time to expand the family? Haha. Just trying to find a reasonable excuse for having so many animals really! !